The controversy over the revelation of the Kochi franchise's ownership details has taken a new, and possibly more serious, twist with ramifications beyond the IPL and the BCCI. In the past 24 hours Shashank Manohar, the BCCI president, has written a strongly worded letter to the IPL commissioner Lalit Modi criticising his decision to make public the ownership details, while Shashi Tharoor, a minister in the Congress-led federal government and a moving force behind the Kochi bid, has responded to charges of a conflict of interest by calling it an "extraordinary breach of all propriety" by Modi designed to discredit the franchise and disqualify the ownership. For his part, Modi is reported to have responded to Manohar's letter by saying his revelations on Twitter were "in no way a breach of confidentiality". He went on to say that the Kochi franchise had "a lot to hide and as such have lied about who are the actual owners of the shares." March 21: Auction re-staged; Sahara wins Pune bid, Rendezvous group wins Kochi for $333.33 million. Shashi Tharoor, an MP from Kerala and junior foreign minister in the Congress government, plays facilitating role. Interim: Reports suggest Rendezvous' surprise win has upset bigger players. Tharoor reportedly meets Congress leaders, asks them to ensure pressure eases on Kochi owners, says he has no personal material stake in franchise. April 9: Media reports say BCCI has raised questions over shareholding pattern, asked Rendezvous to clarify its ownership structure. April 10: Kochi owners meet Modi in Bangalore, sign formal agreement to be part of IPL, disclose ownership structure. April 11: Modi, in response to questions on his Twitter feed, reveals Kochi shareholding pattern. One shareholder is a woman whom Tharoor says he "knows well". April 12: Kochi complain to BCCI over Modi's revelations. BCCI chief Manohar criticises Modi for his action. Modi defends himself, saying no breach of propriety. April 12-13: Tharoor issues statement denying any personal stake in Kochi and alleging Modi wants the franchise moved out. "I have minutes of what they [Kochi franchise] said at the meeting. And, in fact, when I questioned who the shareholders were, they had no answer," Modi wrote. "They said they would revert back. Within minutes of me asking the same, I got a call from Shashi Tharoor asking me not to ask about who these shareholders are. You [Manohar] had mentioned that we should ignore who this owner is, but our condition requires us to authenticate who they are. "I am happy to disclose all the facts at the next governing council meeting. As regards not raising it at the time of the tender - we didn't have the foresight to go through the voluminous documents attached to verify each and every shareholder. As regards many other things I have said on my Twitter account, they have actually not been any classified information. It's factual and only something we have or would have put into the public domain." The BCCI's only official response to the developments was an announcement, made through a vice-president, Rajeev Shukla, that a meeting of the IPL Governing Council would be convened within 10 days to "discuss all the issues and take a decision". In his letter, as reported in the Times of India, Manohar chided Modi for revealing the stakes of Kochi's owners, saying the BCCI was a body that "functions in accordance with its constitution" and not through the media. "The issue, if any, could have been discussed at the governing council meeting and that action on your part of raising it on Twitter is unbecoming of you as a chairman of the a sub-committee of the board. Your action is in serious breach of the confidentiality clause in the agreement," Manohar wrote. "Till date, you have made public statements about a lot of issues which were not even discussed in the meetings of the governing council when it is the governing council which has the authority to take decisions with regard to each and every issue related to IPL." Tharoor's part in the story stems from his relationship with Sunanda Pushkar, one of those listed by Modi as having free equity in the Kochi franchise. While media reports suggest they have plans to marry, Tharoor in his statement referred to her as someone he knew well but said there was no material gain from it. He said he had "neither invested nor received a rupee for my mentorship of the team… Whatever my personal relationships with any of the consortium members, I do not intend to benefit in any way financially from my association with the team now or at a later stage." 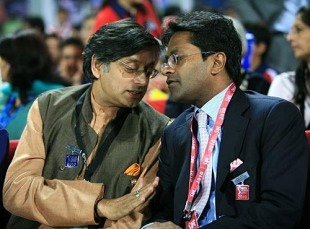 Tharoor said the consortium's successful bid in the March 21 auction "upset the plans of a lot of powerful people, who had wanted the franchise to go elsewhere". He said "attempts were made by Modi and others to pressure the consortium members to abandon their bid in favour of another city in a different state". He also denied Modi's charge that he had called the IPL commissioner and asked him not to probe the ownership structure. He had called Modi, he conceded, but "only to ask why he was further delaying the approval of the franchise when all the legal requirements had been fulfilled". "I called Mr Modi to ask why he was further delaying the approval of the franchise when all the legal requirements had been fulfilled.. Mr Modi had held up approval by the IPL of the franchisee agreement earlier in the day, by insisting on the reversal of a change in the document that he himself had earlier suggested. "This change was made, the consortium members flew to Bangalore and met with Mr Modi after that night's IPL game for what they had been told would be a routine exercise. Instead they were submitted to a barrage of questions which led some to suspect that Mr Modi was seeking a further excuse to delay approval. This was the reason for my intervention with Mr Modi. Had he conducted himself in good faith throughout, no call would have been necessary."